Most of the world forgets Park City exists in seasons other than winter. This place is one of the reasons I love Utah so much. We get four distinct seasons with each having so much to offer. It reminds me of the song “If Ever I Would Leave You”. Summer in Park City brings cooler temperatures than the lower valley flows (15 degrees today), green verdant views, and the smell of pine. 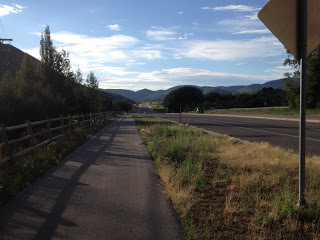 My mom rents a condo for the family so we’re treated to a vacation less than an hour from home but far enough away it feels “away.” In day 1, I’d taken a bike ride down one of many bike trails crossing the area, hit up an art fair and had dinner on the deck of Deer Valley. This area is a Mecca for mountain biking. Many of the resorts provide miles of mountain biking that can be accessed by ski lifts. In the area, are rivers for flyfishing, a reservoir for boating, and first class golfing. Many resorts have zip lines and mountain coasters. If you’re missing winter, check out the Olympic Park oval where the freestyle jumpers are practicing using a pool (watching is free). If the outdoors aren’t your thing then you’re on the wrong blog. But if you’re still reading, Park City has free concerts almost every weekend and there’s usually some sort of festival going on. The shops are fun to hit up. I would recommend coming in July or August for the activities, as the resorts are still recovering from winter in June.